Street races are illegal races held on public roads. They are incredibly dangerous because the drivers are often untrained, and driving in heavily populated cities, at speeds sometimes close to 200 mph. The drivers rarely were protective clothing, or have their cars modified to become safer. Naturally street races often go horribly wrong, ending in injury, explosions, and even death. A 20 year old biker, called Malachi Mitchell crashed during a huge motorcycle street race involving over 200 riders often exceeding speeds of 200 mph. The event had over 150,000 spectators and happens regularly in Northern Ireland. 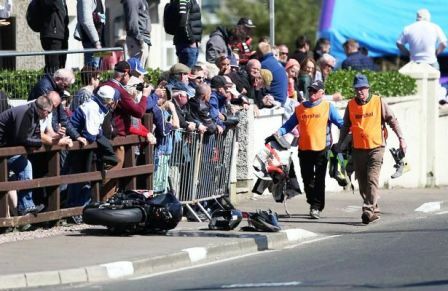 Although there were so many people competing at such dangerous speeds, he was the only involved in the crash, and luckily the incident didn’t harm any spectators or other riders. Mitchell was especially good at street racing and had many fans who thought he would go far in the sport. This is known as one of the fastest street races in the world, and naturally one of the most dangerous street races because of that.